is a professor at the Santa Fe Institute, working at the intersection of physics, biology, and the earth sciences. is a professor in ecology, evolutionary biology and biomathematics at the University of California, Los Angeles. Talk to high-school students preparing for their science exams, and you’ll probably hear two things: that they’re scared of physics, and relatively comfortable with biology. Strangely, this is contrary to the view of most researchers. The scientific zeitgeist is that physics is easy. Its simplicity comes from an ability to create crystalline theories that are powerfully predictive, for everything from the existence of subatomic particles to how light bends around stars. Biology, on the other hand, is much harder to distil into elegant theorems and mathematical equations. For this reason, some eminent thinkers have argued that cells and forests are harder to understand than distant and difficult-to-observe black holes. But perhaps there is no such thing as an easy or hard discipline. Maybe there are only easy and hard questions. Biology only seems so hard because it has been defined by a set of very hard questions. Physics only seems easy because centuries of effort by deeply insightful thinkers have produced a set of answerable questions. What makes biology so challenging, ironically, is our closeness to it. Ask yourself: who is ‘easier’ to understand – a romantic crush or a work colleague? Our intimacy with biology – as well as to psychology and social science – has led us to interrogate these phenomena with profound knowledge already in hand. We ask very detailed questions, and then we’re surprised by the seemingly mysterious or contradictory answers. On a walk through the forest, we might observe the unusual shapes of the foliage on a maple tree. 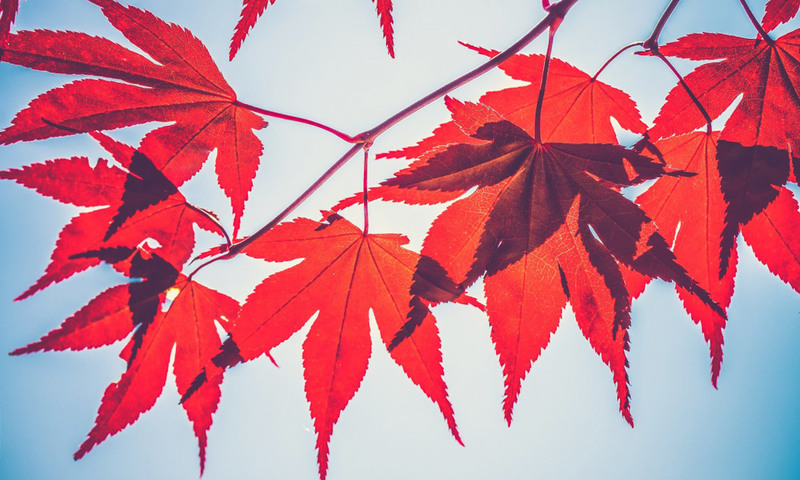 That might lead us to wonder why the leaves have lobes, why they turn red in autumn, what insects live in the leaf litter, and how they decompose and feed the soil. These questions are deceptively complex, despite the naturalness with which we ask them. By contrast, the cold vast vacuum of space and the unseeable smallness of quarks are so foreign to us that we are proud – at least initially – to say the simplest things about these entities, even just to show that they exist. Intimacy has sometimes slowed our understanding in physics, too. The question of how the planets move is one of humanity’s oldest obsessions, and runs through many different mythologies. Yet thanks to our species’ self-absorption, the longstanding theory of epicycles wrongly placed the Earth at the centre of the Universe – a mistake that persisted for around 2,000 years. When the question was abstracted to matters of force, mass and gravity in Newtonian physics, planetary motion became much easier to predict and understand. There are still plenty of hard questions for physicists to puzzle over. If physics pinned its reputation on predicting the next solar flare that could interfere with telecommunications on Earth, it would be viewed as a much more complicated and difficult discipline. Why? Because modelling the many mechanisms that produce the dynamics of the Sun’s surface – all of the gravitational, electromagnetic, thermal and nuclear processes involved – is fiendishly tricky. As for planetary motion, we can get a good-enough picture of a planet’s trajectory by recognising that the massiveness of our Sun allows us to ignore the influence of other heavenly bodies. But if we really wanted to attend to these details, we’d soon find that we can’t precisely predict the motion of three bodies of equal mass. Similarly, with chaos theory, we learned that we can make only rough guesses about the specific position of two pendulums whose motion is coupled together. We cannot, however, say with certainty where either pendulum will ever be. Perhaps the questions that we have demanded of biology are just too hard. How do we save an individual human life? Why is this bluejay slightly darker than the other? But just because we demand more from biology doesn’t mean we can’t pose slightly easier questions. In fact, drawing on ‘easy’ physics can help us figure out how to find those questions. Physicists are particularly good at looking for pervasive, large-scale phenomena that apply across multiple systems and that are likely the result of simple, shared mechanisms. Take the idea of biological scaling. This concept stems from early observations that a mammal’s metabolic rate depends predictably and nonlinearly on body size via a power law. A power law is a mathematical relationship that tells us how much a feature changes as the size of the system increases by orders of magnitude (that is, by multiples of a certain number, usually 10). So when a creature’s body mass increases by 1,000-fold, the principles of biological scaling accurately predict that its metabolic rate will increase 100-fold. But how can the same mathematics apply to something as simple as the gravitational pull between two objects and the messy process of speciation across diverse habitats? In physics, power laws point to shared mechanisms and symmetries that operate across all scales. In biology, our own research – as well as that of Geoffrey B West, James H Brown, and Brian J Enquist – shows that the fundamental mechanism at work is the structure and flow of vascular networks. It turns out that blood vessels tend to efficiently span the body and deliver resources to all of a creature’s cells while reducing the strain on the heart. This simple insight has given birth to a growing batch of successful theories that use the idea of an optimised biological structure to predict phenomena such as the distribution of trees in a forest, how long we need to sleep, the rate of growth of a tumour, the largest and smallest sizes of bacteria, and the tallest possible tree in any environment. However, biology can also give rise to its own unique questions. For example, as our colleagues Jessica Flack and David Krakauer at the Santa Fe Institute have shown, the information-processing and decision-making capabilities of agents (such as primates, neurons and slime moulds) lead to unique types of feedback, adaptability and causation that differ from purely physical systems. It remains to be seen if the additional complexities of biological systems can be explained by expanding on physics-inspired perspectives such as information theory. It might be that the study of biology and complex systems in general will progress one day to insurmountably hard questions – or that a brilliant recasting of the questions will lead to the elimination of current challenges. This might show a path to easier answers, as Charles Darwin did by reformulating questions about the origins and diversity of life in terms of natural selection and variation. 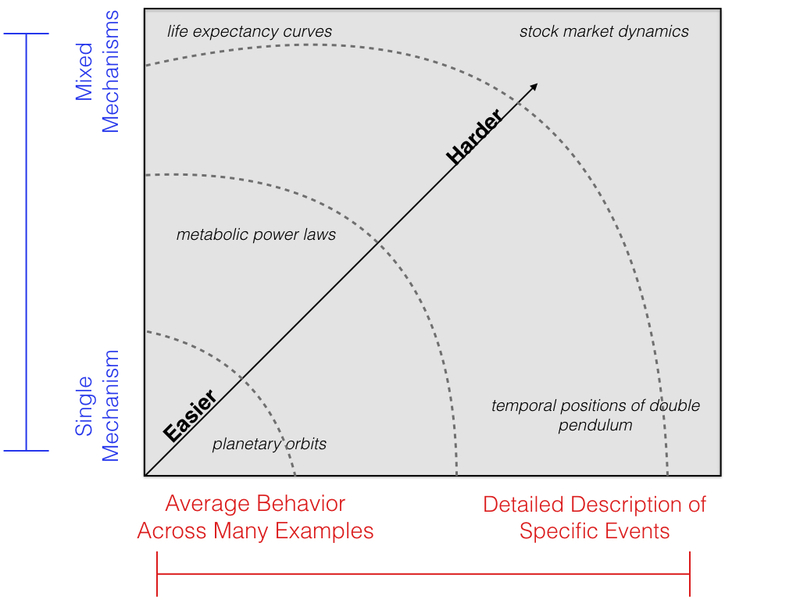 The complexity of systems measured along two axes: 1) the detail and precision required of the scientific description; 2) the number of mechanisms being combined in a particular phenomenon. The hardest sciences ask detailed questions about systems that are composed of many mechanisms. In his article ‘More Is Different’ (1972), the physicist Philip Anderson highlighted the dangers of attempting to reduce everything to the most microscopic level. He focused instead on jumps in complexity that occur at various scales of natural phenomena – such as moving from quantum mechanics to chemistry. However, readers often overlook his argument that effective theories should rest on building blocks that explain the underlying mechanisms of a system – even if those building blocks are relatively large or medium-sized entities. Building on this latter perspective, our argument is that we don’t know if black holes are simpler than forests. We can’t know, until we have a general effective theory that explains the existence of forests or until we can observe the most detailed dynamics of black-hole collapse and evaporation. A statement of relative complexity cannot be made without thoroughly defining the type of questions we are asking for each system. There are probably certain types of enquiries where our knowledge will hit a hard edge, but more often that’s about questions we’re posing than about the systems themselves. So physics can be hard, and biology can be easy. The degree of difficulty depends more on what questions are being asked than on the field. Within complex-systems science, great advances are often made at the interface between these two perspectives. One path forward is to solve the easy questions first, and then use our answers to try to find principles that are helpful when it comes to more detailed questions and theories. It’s possible that by starting with the easy questions, we can slowly ‘build up’ to the hard ones. Or, in the opposite direction, observing the strange similarity of phenomena across disciplines might incline us to search for brand new mechanisms and principles. This will sometimes demand a less detailed, more abstract perspective – what our colleague John Miller, quoting the Nobel prizewinning physicist Murray Gell-Mann, discusses in his book A Crude Look at the Whole (2016). These crude looks – forced by the remoteness of physics, and obscured by the intimacy of biology – should yield many more deep insights and simplifications in science in the years to come. Published in association with the Santa Fe Institute, an Aeon Strategic Partner.